The biggest city in the state of New Mexico and the 32nd biggest city in the United States, Albuquerque is a unique location with a lot to offer. Named after Francisco Fernández de la Cueva, 10th Duke of Albuquerque, this city is located in a central position in the state in Bernalilo County. It stretches out to cover over 189 square miles and is home to more than half a million people, with around a million in the full metropolitan area. A very significant city for the state of New Mexico, Albuquerque is home to many key educational and research institutions, as well as several military facilities. It's also a great touristic location due to unique annual events like the International Balloon Fiesta and fun local attractions and areas to explore like Old Town Albuquerque, the Petroglyph National Monument, the Sandia Peak Tramway, the ABQ Bio Park, the Indian Pueblo Cultural Center, the New Mexico Museum of Natural History and Science, and much more. Albuquerque, like many other locations all around New Mexico, is a super spot to visit on a road trip or RV tour. With so many great natural areas nearby for all kinds of outdoor recreation, as well as lots of fun landmarks and locations in the city itself, Albuquerque is a prime spot to park up an RV and have some fun with family and friends. Read on for details on the best RV parks in Albuquerque. Nicely located in a central position near plenty of good stores, eateries, and other local amenities, the Balloon View Homes & RV Park is a great place to spend some time during an RV trip of New Mexico. Featuring over 80 pull-through spaces with full hook-ups, this RV site offers everything you need to have a good time. 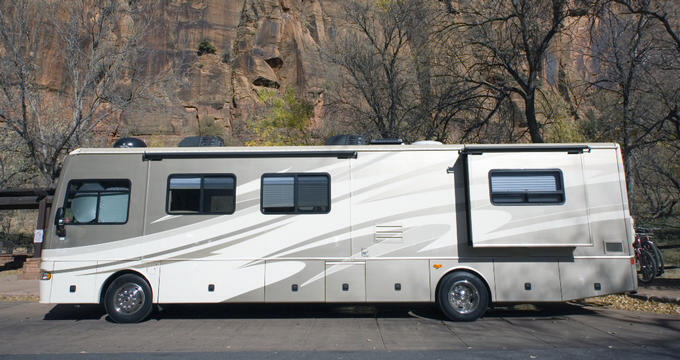 Cable TV and Wi-Fi are included at all RV spaces and the on-site amenities include a large swimming pool, laundry area, restrooms, showers, and a fitness center. Pets are welcomed at this Albuquerque RV park too, so if you'd like to travel with a furry friend, you'll be warmly welcomed to Balloon View Homes & RV Park. The RV park got its name for the fact that it offers some stunning views of the hot air balloons during the annual Albuquerque International Balloon Fiesta. Mere minutes from all of the big spots in Albuquerque, one of the best things about Palisades RV Park is its location. It's nicely situated over on the western side of the city and is easily accessible off I-25. Local bus routes pass through the area, so you can get all around Albuquerque with ease from this RV park, which is ideal for both short and long-term stays. Another big advantage of this RV park is its low rates. When compared to many local rival sites, Palisades RV Park has some of the most attractive rates around, making it a great option for people on a budget. This is a no-frills RV park without too many fancy amenities, but it does features restrooms, a computer area, a dog walk, and a laundry facility. Part of the trusted KOA family of campgrounds and RV parks, Albuquerque KOA Journey is nicely situated on the eastern side of town, offering quick and easy access to many of the top stores, restaurants, and more. This RV park is open all year long and offers the high standards of customer service and top quality facilities that have helped to make KOA one of the most reputable names in the camping business. This RV park features huge sites that stretch out to accommodate even the largest big rig RVs, and on-site amenities and activities include a pool, hot tub, mini golf course, play area for the kids, dog park, bike rentals, pavilion, and a local store. All sorts of fun activities are organized at this RV park and campground too, so you'll never have to worry about getting bored or having nothing to do. Out to the west of the central Albuquerque area sits Enchanted Trails RV Park & Trading Post, another of the best rated RV parks in the city. Nicely situated in a calm, green area with pleasant views and stunning sunsets, this RV park started off as a trading post back in the 1940s and is quite a unique historical site with a lot of charm and personality. More than 100 full hook-up sites are featured at this RV park with electric, water, sewer, and internet access. The park is fully pet friendly and welcoming to visitors from all walks of life. On-site amenities include a store selling gifts and food, a TV lounge, a games room with a billiards table, large laundry facilities, clean restrooms, a swimming pool, a spa, and more. This is definitely one of the best options for anyone planning an RV star in the Albuquerque area, especially if you're a nature lover and want to get out on the hiking trails and spend some time exploring the local natural spaces.